Liquid water has flowed on the surface of Mars within the past five years, suggest images by the now lost Mars Global Surveyor (MGS). The results appear to boost the chances that Mars could harbour life. 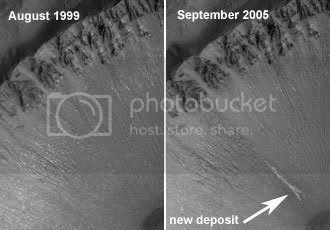 Not everyone is convinced water created the “new” gullies on Mars in areas previously photographed. Allan Treiman of the Lunar and Planetary Institute in Houston, Texas, US, agrees that something flowed recently to make the observed changes. The guys running the Mars Global Surveyor have seen plenty of flowing dust and have a retort that basically says, “this looks nothing like the other streaks caused by flowing sand we’ve seen.” Read the article for it. would have involved 5 to 10 swimming pools’ worth of water. It would have been similar to a flash flood in the desert, says team member Ken Edgett of Malin Space Science Systems. “If you were there and this thing was coming down the slope, you’d probably want to get out of the way,” he says. If the deposits are the result of liquid water flow, the source of the water is not clear. Malin’s team suggests it comes from underground aquifers, perhaps kept liquid at low temperatures with the help of high salt concentrations. Let the debate heat up – is there life on Mars?